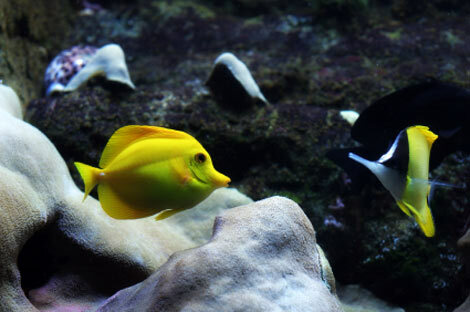 Photo of yellow tropical fish in the Aitutaki lagoon. 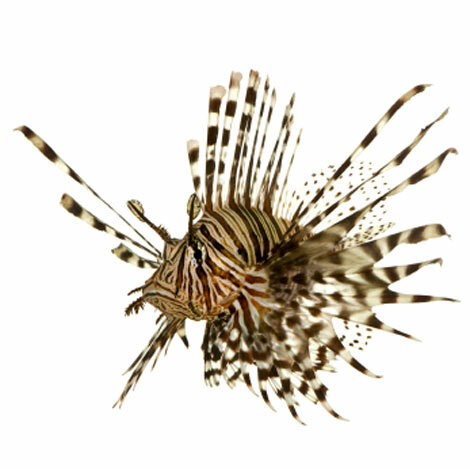 Poisonous barbed Lion Fish can be fatal. Recreational sport fishing Aitutaki and game fishing Aitutaki is a favourite tourist activity. There are quite a few fishing charter boat operators on Aitutaki. If you haven't booked a fishing trip online before you arrive at Aitutaki you could enquire at the Aitutaki Game Fishing Club to find the next available member taking a fishing charter. All fishing charter trips are outside the Aitutaki reef. Some troll close to outside the reef but wisely most target pelagic fish such as tuna and big game fish such as marlin and swordfish. Some fishing charters in calm weather will even go far from Aitutaki to the small, uninhabited mid south Pacific islet of Manuai which is relatively untouched. 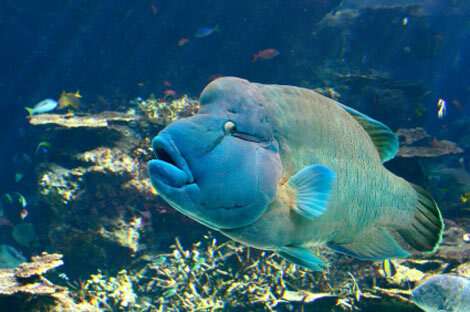 Above: Humped headed Maorri Wrasse Photo. I got a world fishing record in 1989 from the IGFA Fort Laudadale Florida for catching one of these fish. I've got the line class record hanging in my office but I thought the "World Record Certificate" would be better served in helping to promote the Aitutaki Game Fishing Club. That fishing certificate record is on long term loan in the Aitutaki Game Fishing Club. The unusual, unexplained to me thing was that while I owned the largest game fishing boat on Aitutaki, I caught this what I thought was a coral eater, with a chromed, hexagonal sliced fishing lure. When I first arrived in Aitutaki in 1980 I went spear fishing outside the reef with a few Aitutakian warriors. Beautiful Pururangi's brother was one I remember. They free dived and speared a HUGE maori wrasse. One spear stuck in, one bounced off a fish scale the size of bank notes. The fish went berserk, finally resting under a coral ledge. I dived down with my Hawaiian sling which in fishing Perth we call a "gidgee" with 6 barbed prongs. I speared this beautiful majestic fish right on the forehead and struggled with it on the end of my spear at about 10 metres deep. The island boys dived down and grabbed the other tethered floating spear gun and together we got this HUGE fish to the surface. It was so heavy that we had to push one side of the aluminium boat gunwale down near the Pacific Ocean surface to enable us to roll this HUSE fish in. This type of Pacific fish is typical for carrying ciguatera (fish poison) but after testing it feed the village. I hear a storey that in French Polynesia they tested on a cat. They ate. After not waiting long enough, the cat dropped dead and everyone at the party got sick. A storey about fishing in Aitutaki would not be complete without homage to skillful Polynesian fishermen. One day near the Aitutaki airport short runway I saw an Aitutakian warrior allow for refraction of light, throw a hand spear through the air to stick into a big parrot fish more than 20 metres away! Jaw dropping fishing. Matai Simiona, chief of the Aitutaki, was my fishing partner when power boats in a fishing completion unsuccessfully buzzed boiling water under diving birds half a kilometre west of mutu Maina. We sailed in with 4 lines at the back of my Hobie 16 catamaran. After filling big bags full of tuna, ourselves and lower part of sails covered in fish blood, with the boat weighed down with fish we retired to the harbour at Arutunga. After catching a couple of mahimahi (dolphin-fish, double strike, on game fishing rods) kilomtres south east of Aitutaki, with a Sydney tourist fisherman with one glass eye on board, in an Aitutaki Game Fishing Club fishing contest, a storm blew up from the north west of Aitutaki. After two failed attempts at surfing waves right at the almost dry reef and the whole Hobie 16 leaping high over the lip of oncoming waves on both retreats, on the third attempt, I let go the tiller, ran up the bow, jumped off onto the reef in knee deep water, dragged the boat across the top of the reef, sailed this short cut across the Aitutaki lagoon to beat some of the storm battered fishing boats which rounded the longer way outside of Maina islet to home. Soldier fish. These and similar looking squirrel fish with painful gill plate spikes are my favourite fish to eat. An orange oil exudes from flesh when cooked. 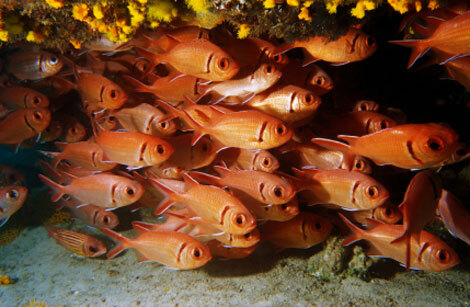 As shown in the photo, these red tropical fish school in and under coral reefs by day. 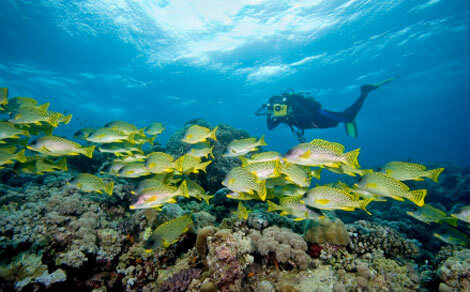 Exotic coral reef fish photos can be seen in Neil Mitche's fish of Aitutaki photo album. Diving reefs of Aitutaki at night is an amazing, different way to see nocturnal reef fish like these or day fish such as parrot-fish sleeping in their cocoon. One day my small 8 horsepowered boat got dragged backwards by simultaneous hook up of five tuna fish. This meant some fishing lines sagged and wrapped the propeller. With prop out the water, shark fins cruised under my elbow as I unwound fishing line from the jammed propeller. Other fishing stories such as my small catamaran being dragged around the Pacific Ocean by a shark will have to wait till when I get time to write more about fishing and fish of Aitutaki or better still after I find time to proof read and fix mistakes. 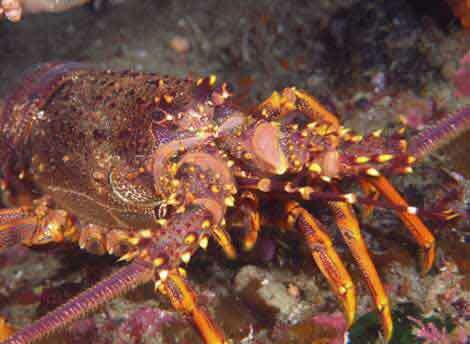 Photo of painted crayfish. "Matai Simiona", showed me how to catch painted crayfish (lobsters). With big gum boots he'd run across the reef, on a dark night holding up a tilly-lantern. This expert Polynesian fisherman would pick crayfish up with his hands and put them in a big sack I carried. After a couple of sacks full of crayfish we'd retire to enjoy this Cook Islands food. Unlike South Pacific Islands west of Aitutaki, sea snakes are VERY rare. I only saw one in ten years on the Aitutaki lagoon nearly every day and that was a dead one washed up on the beach.